This was Asakura Haruka's singing event for minor idols. I went to see Itou Asuka and three of the Maru Maru Gakuen Housoubu girls, who were one of the guests. There were around 20 people in the crowd. Asuka's stage started at 20:00 and lasted for around 30 minutes. 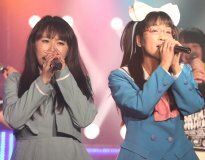 The members of Maru Maru Gakuen Housoubu that participated were Shiotsu Saori, Hino Kanako, and Tagaki Yuki, who formed the group Chelsea, that sings and dances k-pop songs. The Asuka/Maru Garu stage flowed as follows. 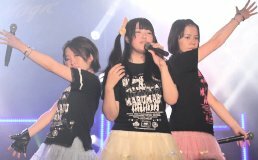 For the first song, the girls were wearing the black Maru Gaku T-shirt and frilly skirts. The Chelsea girls also wore a kimono style, flower design vest over the T-shirts. For the Morning Musume medley, the Chelsea girls took off the vests, and everyone wore the black T-shirt and frilly skirts. Then Asuka went off the stage, and Chelsea sang "Magic Girl". After Chelsea sang, Asuka came back wearing her green (second class) Kira Melo uniform. Asakura Haruka also came out, and she was wearing the blue (first class) Kira Melo uniform. All five girls sang "Daisuki" together. After the songs, there was a short talk with Haruka. The group D.A.Gimmick is made up of two girls, Ishikawa Himeka and Kasai Rumi, who are new seiyuu for the AGC38 project. I brought my 60D and EF70-200F2.8L lens, and my compact camera (Powershot S90). Photos without flash allowed of the stage (talk and songs). During Asuka's stage, I stood along the left wall (facing the stage) and took photos using a monopod. I ended up taking around 1400 photos, with 483 worth keeping.